Juneberry Lane: St. Patrick's Day Delicious: MIni-Guinness Cupcakes!! 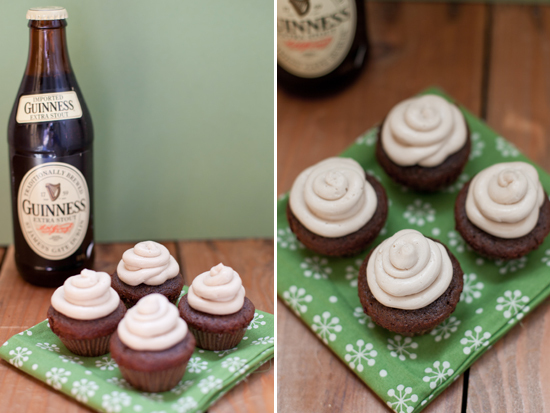 St. Patrick's Day Delicious: MIni-Guinness Cupcakes!! Can you believe it is almost March already?! And you know what this means...St Patrick's Day is fast approaching. And just in case you are looking for a fun recipe to bring to the office or whip up for your Shamrock Shindig that is sure to inspire an Irish-type of chuckle, well look no further! These yummy cupcakes from Sugar and Charm will fill all of your friends, guests, or co-workers with a bit o' leprechaun mischief and make for the perfect conversation starter too! See for yourself . . . 2.) Bring stout and butter to a simmer in a large saucepan over medium heat. Do not boil. Add unsweetened chocolate chunks to hot stout/butter mixture. Whisk until chocolate melts. Turn heat off and let cool. 3.) Add sugar to chocolate mixture and whisk to combine. 4.) Sift flour, baking soda and salt. 5.) In a stand-alone mixer with a whisk attachment, combine the eggs and sour cream on medium speed. Add stout-chocolate mixture to the egg mixture and combine on medium-low speed until incorporated. Slowly add flour mixture in thirds to chocolate mixture with whisk attachment. Scrape the sides with your whisk to make sure you get all the dry ingredients combined. 6.) Place mini cupcake papers in mini pan and divide batter into cups evenly. Fill about 2/3 of the cup. Bake for 8 minutes and do not over cook or they will turn out dry. 7.) Let cool on wire rack before frosting. 1.) In a sauce pan, simmer Guinness on low heat for 10-15 minutes, until stout becomes reduced and a little thicker in consistency. 3.) Slowly add reduced Guinness a little at a time. Taste test to desired flavor. You may or may not use all the Guinness reduction... I did! ~ Make sure to beat the frosting on high until it's thicker and smooth. At first my frosting started to curdle, especially when I add the beer, but it just needs to be whipped on high to become fluffy again. My beer never became a thicker consistency, but I still used it and it worked great. you cook them too long they'll be dry! Isn't that fun? Hope you have a fantastic week! !